This was photographed inside a branch of Boots, the ubiquitous pharmacy chain in the UK. Shops are often a place of aspiration and temptation which are found in close proximity to one another and only separated by shelves and aisles. 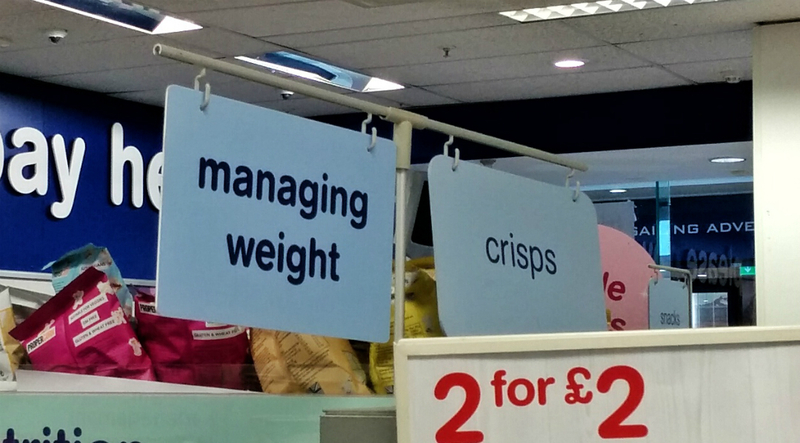 In this case, the aspiration was managing weight and the temptation came in the form of packets of crisps (or potato chips to those in North America), and they were found in the adjoining aisles. Perhaps losing weight is too daunting a task, and in any case managing weight is better than going on a fad diet only to rebound with interests. I am a weak-willed person, so I am easily tempted. Or I might be tempted to purchase something from both sections, in an act of denial where the aspiration cancels out the temptation. Thankfully I did neither, though had it been chocolates, it might have been another story.